This 1987 Symbol appears to be in expected condition for a boat that has been sitting and not used. The isenglass was lost in removed after being ripped in a storm. The boat needs updating all around, including electronics. A survey is needed to determine the current condition of the mechanics and the hull. Stock #103572 Elegant styling. Lots of exterior and interior space. New generator and transmission. Rare find! 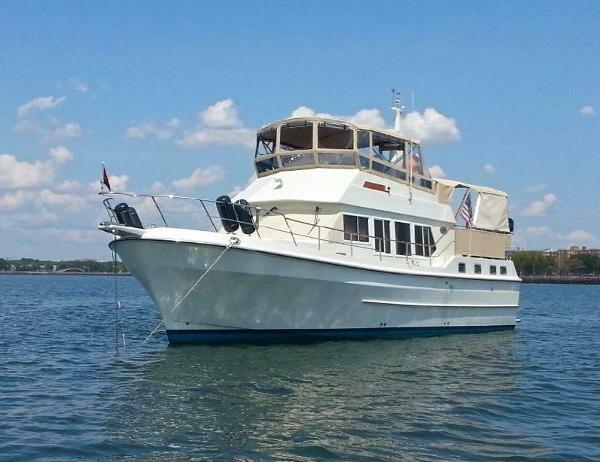 If you are in the market for a motoryacht, look no further than this 1987 Symbol 51 Yacht Fish, just reduced to $84,900 (offers encouraged). 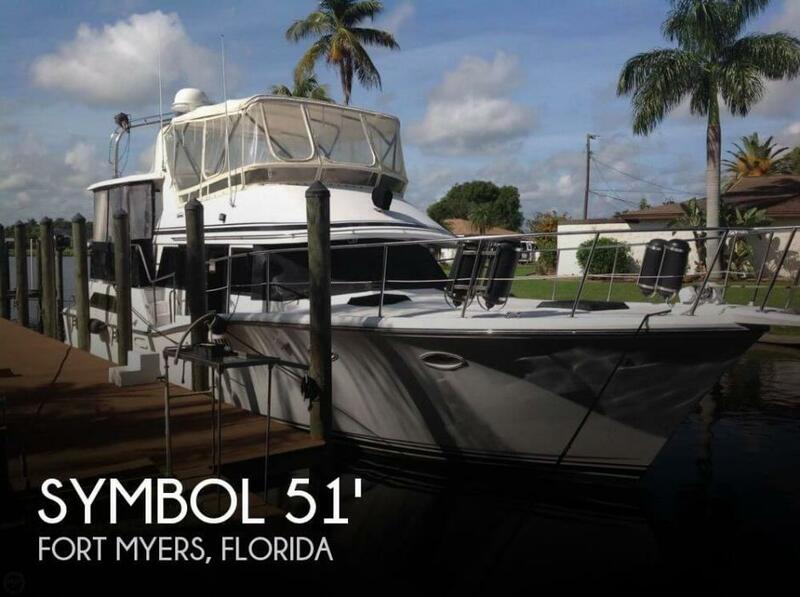 This vessel is located in Fort Myers, Florida and is in good condition. She is also equipped with twin Caterpillar engines that have 1,460 hours. Reason for selling is death in the family. The boat is in good condition for its age. Shows very good and looks much newer. Owner states the boat has been well-maintained and it shows. A few minor blemishes on the hull with some minor spider cracks on the port bow deck. All of the canvas was replaced new 4 years ago. All components are in great shape with no stains on the canvas. The eisenglass is clear and the hardware is in good working order. The flybridge is comfortable with well laid out controls w/ depth finder and nice lounging seats to relax. Spacious Aft Deck with plenty of room for furniture and bbq. The Main Salon has a recently updated interior with an Italian Leather couch, recliner w/ottoman to relax and watch a movie on the TV/DVD player. The Owner states that the carpet does need replacing as it shows wear and tear. The boat also has a dehumidifier. The cockpit has a competent gauge package. (minus gas gauges, came from factory without) Also, the speedometers are not working. A wooden Captain's Chair is a great touch. The galley is well appointed with a stovetop w/oven, corner sink, refrigerator freezer and microwave. Plenty of cabinet space! All wood tones. The staterooms are both spacious with plenty of storage. Aft Stateroom head needs some repair. Along with the normal canvas w/windows, the boat also has a black canvas that covers the main salon windows for privacy, which is in great shape. Owner states engines are in good shape and ready to go and that all electronics are in working order except for the speedometer as mentioned above. Owner also notes that the upper helm port trans-cable is stiff. Stock #091119 Slip included thru 3/2019!! Good Condition! Very spacious. Perfect family boat. 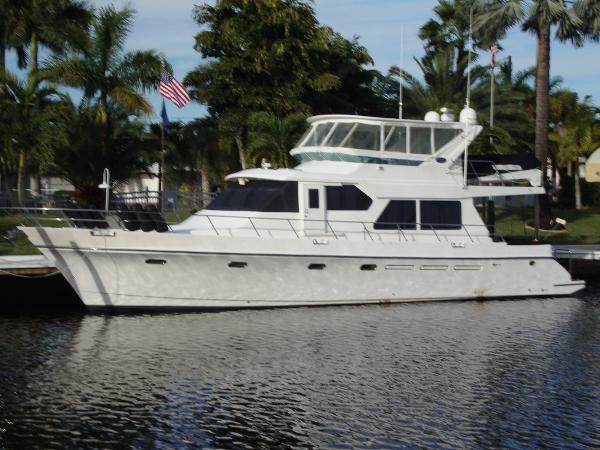 If you are in the market for a motoryacht, look no further than this 1988 Symbol 39 Sundeck, just reduced to $30,000 (offers encouraged). This vessel is located in Grafton, Illinois and is in good condition. She is also equipped with twin Mercruiser engines that have 1,207 hours. Reason for selling is seller needs to get out of boating for awhile. 2005 Symbol C-18 This 68' Symbol Motor Yacht DREAM GIRL was designed by renowned naval architect Jack Sarin, well known as designer of Westport Yachts, West Bay SonShip, Crescent and other large motor yachts. This Symbol was designed for the owner operator, large enough for extended cruising but small enough for a couple to handle without crew. Built with three cabins, all with en-suite heads, plus a day head in the salon, a large back deck, walk around side decks, and a great entertainment area on the flybridge makes this a well-rounded cruiser. 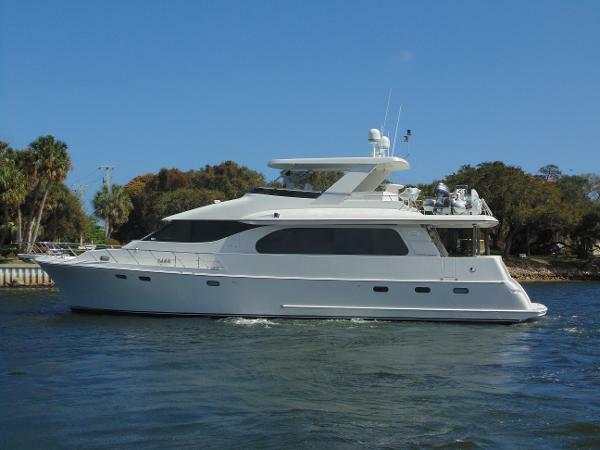 2005 Symbol C12 AMAZING GRACE is extremely user friendly with her three station controls (pilot house, flybridge, and cockpit) bow and stern thruster, wide safe full walk around decks, and robust stainless steel hardware. Her shoal draft will make for an excellent Bahamas cruiser. Prop pockets, four bladed Nibral wheels and the 705HP CATs will cruise very economically at 10 Knots, yet deliver 17-18 Knots at fast cruise. 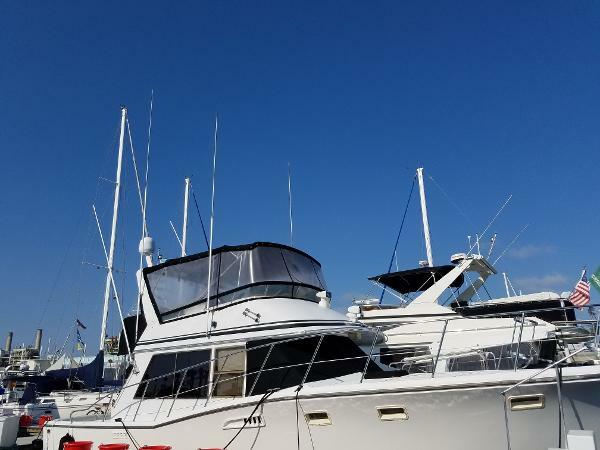 (2050 RPMS, WOT 2300 RPMS) The pilothouse layout is extremely user friendly as it provides excellent visability not only from the helm, but also from the large port side dining area and the large granite top galley to starboard. Two access points, (cockpit and pilot house) lead to the large flybridge which contains a (2) captains helm seats, ample guest seating, grill, sink, and has (2) Large 24vdc cold plate refrigeration chests to use as additional refrigerators or freezers or (1) of each. The 1000lb UMT davit and tender is launched from the flybridge which leaves great access to the walk through transom to the swim platform. The interior joiner work has many custom features that blend well with the large side windows and sliding cockpit door. 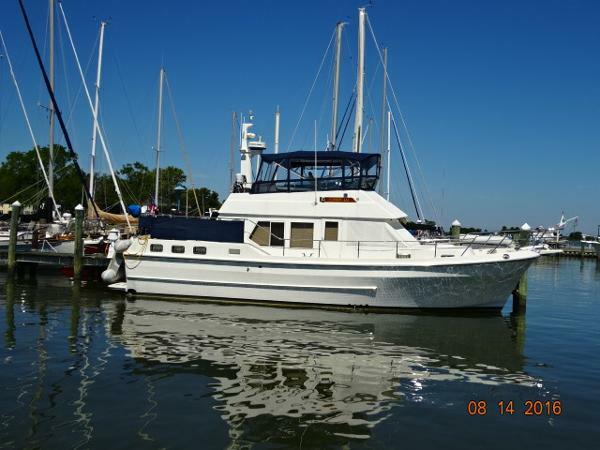 1987 Symbol 41 Sundeck Twin 210 HP Caterpillar 3208 NA Diesel Engines & Northern Lights 10KW Generator (New 2007) Blue Hawaii is a very fuel efficient and reliable cruiser with her naturally aspirated diesel engines. She has had many upgrades including two new fuel tanks 2009, new Northern Lights 10 KW Generator 2007, 2-new AC units 2014, and was just hauled for a fresh bottom job & new rudder glands March 2015. Both engines and generator were also just completely serviced February 2015. 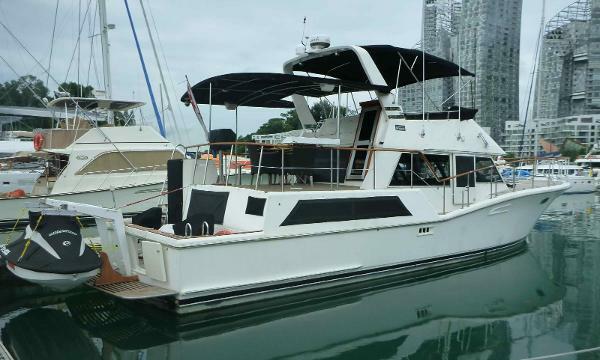 This Symbol 41 Sundeck is a Taiwan-built Sundeck Cruiser with an all-teak interior. Modified-V solid fiberglass hull with a shallow keel for directional stability. Large Main Salon with Entertainment Center, convertible sofa and twin lounge chairs. Master Aft Stateroom with centerline queen berth and ensuite head with electric toilet and separate shower stall. Forward Guest Stateroom has over and under twin berths with ensuite head and electric toilet. Galley is mid-ship with U-shaped dinette opposite and to starboard.Huge Sundeck for entertaining and guests with access to Flybridge. Wide side-decks and sturdy rails make bow access safe and secure. Call today to schedule a appointment, viewings available seven days a week!! 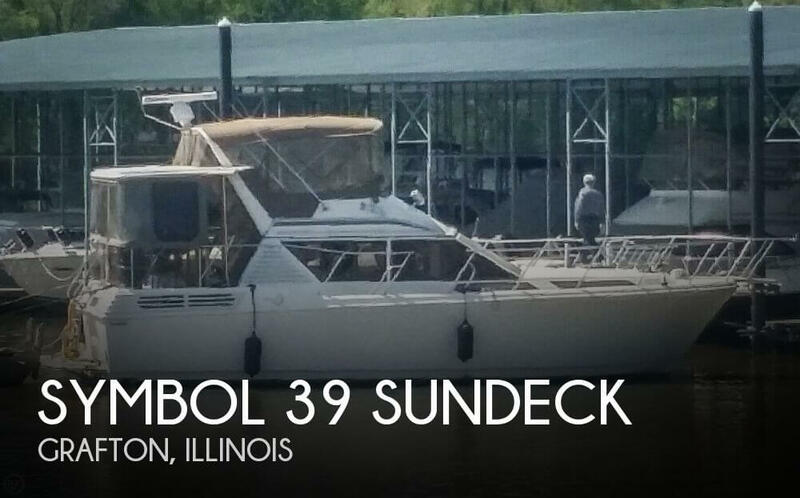 1989 Symbol 39 Sundeck This aft cabin motor yacht has been well kept and is very nicely appointed. This Symbol has two private cabins, diesel engines with only 560 hours, and beautiful wood work on the interior. The yacht is in a covered slip and kept in fresh water. 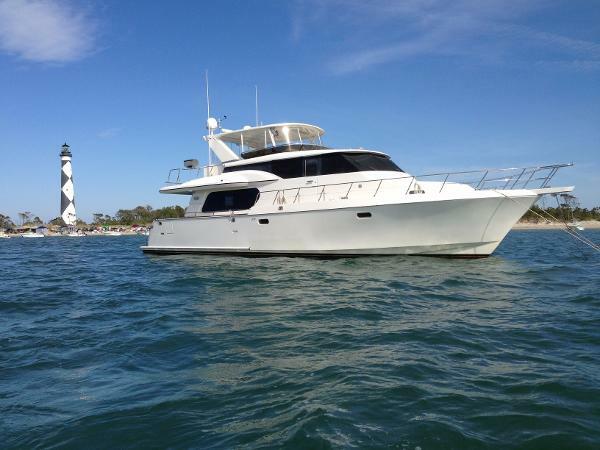 With the low hours and great condition, this yacht would be a great pick for extensive cruising ! 2007 Symbol C18 "e" is truly a vessel that must be seen to be appreciated. The very knowledgeable yacht management company and owner accept only the best when it comes to maintenance for this vessel. From 2014-2016, "e" has been constantly upgraded from bow to stern, services are all up to date and this yacht shines both inside and out. 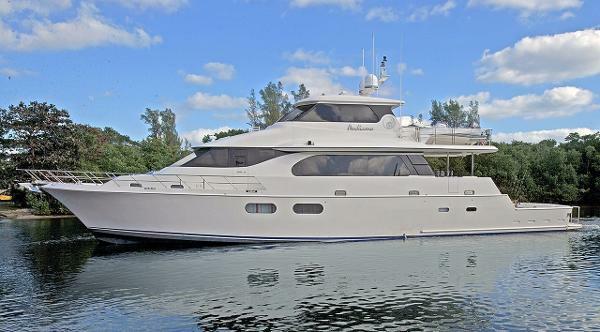 Put "e" on your list to see before buying another yacht in this class! 2001 Symbol 42 Classic Trawler Cindy Lu is a well-maintained, classic Symbol sundeck trawler offering a 2 stateroom 2 head layout, an enclosed shower in each head, bowthruster, inverter, Caterpillar main engine and a Northern Lights generator. Maintenance log, oil analysis reports and extensive records are available. Cindy Lu would be a perfect Great Loop candidate. 1984 Symbol 44 Sportfisher The cabin on this Sport Fisherman has just had the cabin remodeled. She is looking good and ready to to go. Call for an appointment today. 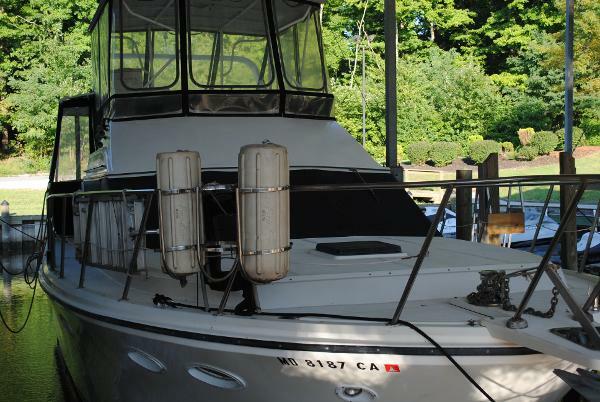 1985 Symbol 44 1985 SYMBOL 44' DO NOT MISS OUT ON THIS OPPORTUNITY TO OWN A VERY WELL APPOINTED SPORT FISHER WITH MUSCLE AND STYLING TO MATCH. VERY WELL EQUIPPED FOR FISHING, FAMILY CRUISING OR POTENTIAL CHARTERS. VERY SPACIOUS LAYOUT WITH ROOM TO ENTERTAIN AND ATTENTION TO DETAIL THROUGHOUT. POWERED BY TWIN CATERPILLAR DIESELS EACH PUSHING 450HP MAKES CRUISING AT 17 KNTS A BREEZE WITH A TOP SPEED OF 24 KNTS. ESTIMATED CRUISING RANGE OF 800 MILES WILL TAKE YOU WHERE YOU NEED TO GO TO FIND THE FISH OR YOUR OWN PARADISE. 1985 Symbol 51 Motor Yacht Fully Rebuilt Classic Symbol Motor Yacht. "Enchante" has been refurbished to a very high standard in 2011, including being re-powered with Brand new Cummins Diamond 6BTA engines. Fresh bottom paint, new Nick Jackson Jet-ski Davit, new SeaDoo jet-ski, new Kohler 9KW diesel power generator, new air con (60,000 btus), new granite look counter tops and stainless steel surfaces, new appliances, new electronics, new fridge & freezer and new bimini frame and canvas. The extensive recent refit makes Enchante not only a very capable cruiser, but also a gorgeous live-aboard option. Must be seen to be appreciated. 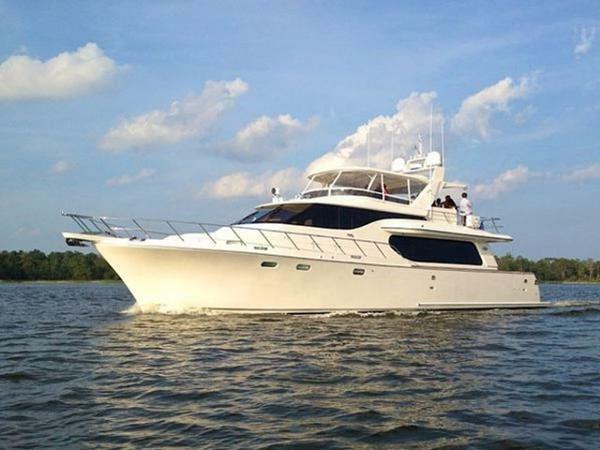 2000 Symbol Pilothouse Motoryacht This 2000 Symbol 558 Pilothouse Motoryacht is a beautifully laid out vessel that sleeps eight in comfort in three staterooms. The salon is accessed from the teak soled cockpit. Up two steps and forward, is the galley, dinette and lower helm station. Staterooms are accessed by the spiral staircase to the port side of the lower helm station. Access to the bridge is from either the cockpit or the stairwell from the lower helm station. The sidedecks and foredeck can be reached from the cockpit or the portside pilothouse door. The oversized swim platform is accessed from the transom door and has removable stainless rails. Take a look and you will fall in-love with this beautiful vessel! 2010 Symbol Cockpit Motor Yacht 2010 85’ Symbol Motor Yacht Cockpit ANDIAMO was custom built for extensive yacht traveling and exploration. She is the perfect combination of a motor yacht, expedition yacht set-up to enjoy worldwide traveling while fishing and diving exotic islands.THE VESSEL IS IN FORT LAUDERDALE, FL AND IS BEING KEPT UNDERCOVER. OWNER WILL CONSIDER TRADE OF LATE MODEL 55’-70’ VIKING CONVERTIBLE!!! 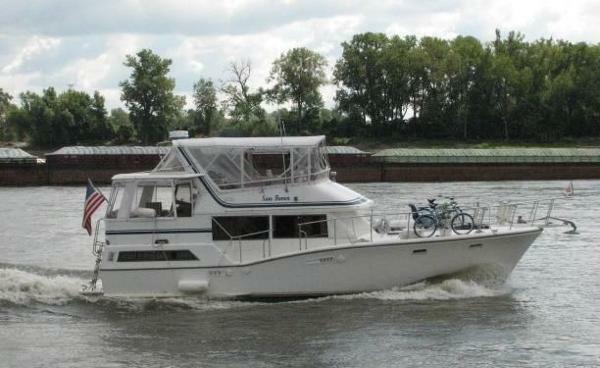 1987 Symbol 44 Sundeck Motoryacht Sea Fever is a classic Symbol sundeck motoryacht offering a 2 stateroom 2 head layout. She offers updates like Corian countertops, updated flat screen TV's and a new battery charger. Sellers rave about her front porch (large foredeck) and back porch (similar large sundeck). 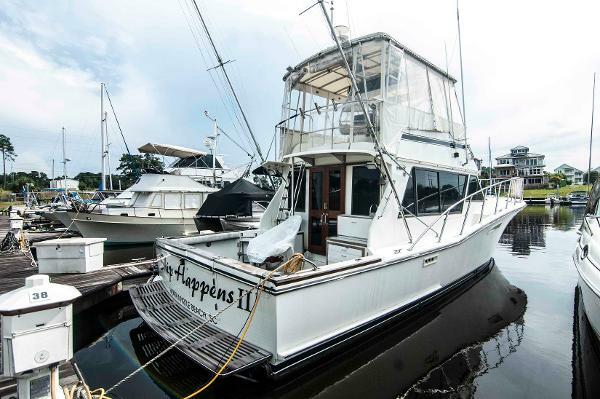 This versatile yacht has completed the Great Loop and is well-maintained, so she is ready for her next adventure with a new owner. Priced reduced!